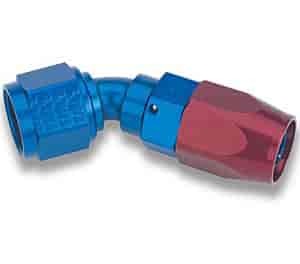 Earl's AN Swivel-Seal Hose End Fittings are made of premium aluminum alloys that meet or exceed aerospace specifications. They have dual plane anti-seepage seals and stainless retention pins that adjust 360° after installation. When using an angled fitting, the precision machined bent tube design provides second-to-none fuel flow capacity. Don't settle for substandard imitations... the Swivel-Seal brand is the most reliable and widely sold premium hose end on the market. The fitting design has been aerospace proven for over 55 years and used by Earl's in competition for over 30 years! Note: Earl's Swivel-Seal Hose Ends are designed for use with Earl's Perform-O-Flex, Pro-Lite 350, Pro-Lite Ultra, and Auto-Flex Hose.